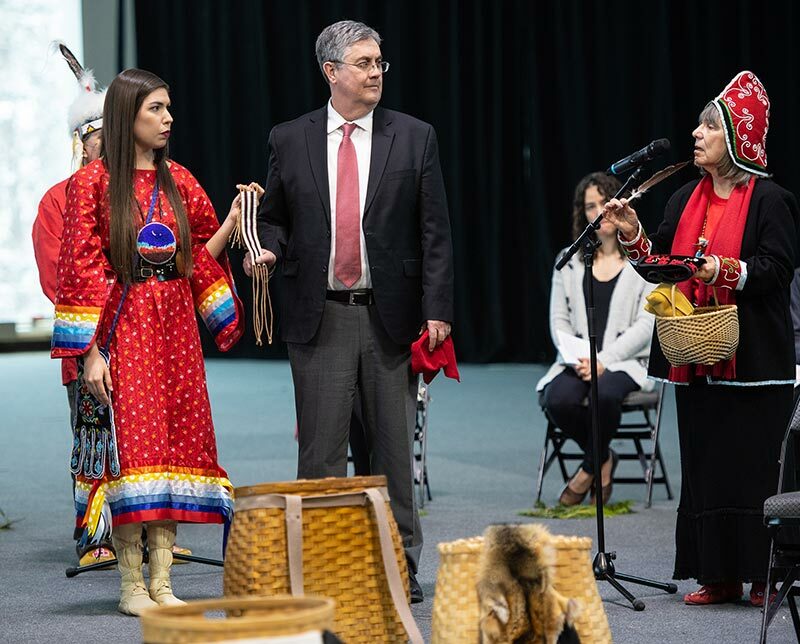 Amanda Reid Rogers has been officially installed as Piluwitahasuwin at the University of New Brunswick following a traditional celebration on the Fredericton campus. The traditional celebration, entitled Piluwitahasuwawsuwakon: Forging a New Path, officially installs Ms. Rogers to the position. “Reflecting on this historic moment for UNB, the installation ceremony is an envisioning exercise for all those involved as well as a sacred commitment to piluwitahasuwawsuwakon,” says Ms. Rogers. The installation ceremony is required to maintain traditional Wolastoqey protocol related to sacred responsibilities. The event was held in a long house in the Richard J. CURRIE CENTER and included a sacred pipe ceremony, a water ceremony, dancing and drumming, and the presentation of a wampum. Ms. Rogers received a Sacred Bundle, a wrapped collection of sacred items. The sacred bundle will be passed on to her successor. The position of Piluwitahasuwin reports directly to the President’s Office and will promote and expand Indigenous culture and opportunities on UNB campuses and within the community. The establishment of the Piluwitahasuwin was identified as a priority in UNB’s Truth and Reconciliation Strategic Action plan, released in March 2018 and recognized as a Sacred Bundle. The position is supported by the Department of Post-Secondary Education, Training and Labour’s Access and Success program, a program intended to support innovative efforts that remove barriers to post-secondary education. “The Department of Post-Secondary Education, Training and Labour’s Access and Success program supports various projects and initiatives to increase the number of under-represented groups in post-secondary education, including Indigenous learners. We are happy to celebrate and welcome the addition of Ms. Rogers and wish her the best of luck in her new role,” says Post-Secondary Education, Training and Labour Minister Trevor Holder. Ms. Rogers, RN, is Dakota-Sioux with family and community connections in Wolastokuk. Currently a course instructor and master’s student in nursing, she is using a community-based collaborative participatory action research approach for her thesis that is focused on the experiences of Wolastoqey women who are descendants of survivors of the Indian residential school experience in Canada. “In order to nurture Indigenous students and their gifts, it is critical for Canadians to understand treaty relationships, as well as respect skicinuwey (Indigenous) ways of learning, knowing, and being. It has always been my firm belief that our Indigenous communities and nations are resilient, vibrant, beautiful, and sovereign,” says Ms. Rogers. Photo: UNB’s Elder-In-Residence Imelda Perley presents the Sacred Bundle and wampum belt to Piluwitahasuwin Amanda Reid Rogers and Dr. Eddy Campbell, UNB president and vice-chancellor.